Depending on how you’re summer has been going, you’re either excited or sad about this whole back to school thing. Here are some tips to reduce a bit of the stress associated with this time of year and make this time of year kinder to your budget. Schedule a doctor’s appointment. Most sports require a yearly physical anyway. Ask to be placed on their cancellation list if they are booked up. Schedule appointments for haircuts so everyone has a fresh cut for school photos. Cut down on back to school clothing shopping by having each child try on things they already own. Make a list of the items they need to fill the wardrobe gaps. Round up gym clothes and shoes. Do they fit? If not, can they be handed down? Shop at home for supplies from last year. Some of these supplies can be reused: rulers, calculator, pencils, pens, barely used notebooks, binders, and glue. What is the condition of their backpack? Will it last another year or until retailers mark them down? Stock up on art supplies and printer ink as well as extra poster boards for projects and science fairs. Make a homework station. Keep extra school supplies readily available so they are able to get down to business after school. Reduce morning drama. Have your kids lay out their clothing choices the night before, pack their backpacks and put their equipment for after-school activities by the door or in the car. Start using an alarm clock early on with your children so you won’t have to remember to wake them. You’ve got this! 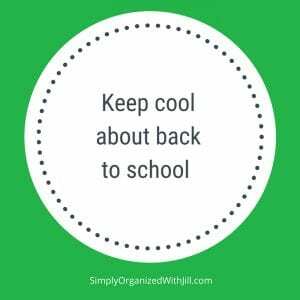 Share your best stay cool during back to school tips in the comments.